Ferris, C. J., Gilmore, K. J., Wallace, G. G. & in het Panhuis, M. (2013). Biofabrication: an overview of the approaches used for printing of living cells. Applied Microbiology and Biotechnology, 97 (10), 4243-4258. The development of cell printing is vital for establishing biofabrication approaches as clinically relevant tools. Achieving this requires bio-inks which must not only be easily printable, but also allow controllable and reproducible printing of cells. This review outlines the general principles and current progress and compares the advantages and challenges for the most widely used biofabrication techniques for printing cells: extrusion, laser, microvalve, inkjet and tissue fragment printing. 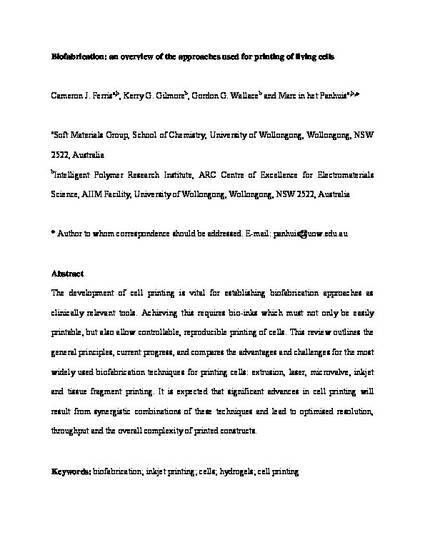 It is expected that significant advances in cell printing will result from synergistic combinations of these techniques and lead to optimised resolution, throughput and the overall complexity of printed constructs.